. Oh, and the OP is amazing; one of the best of Fall 2014. 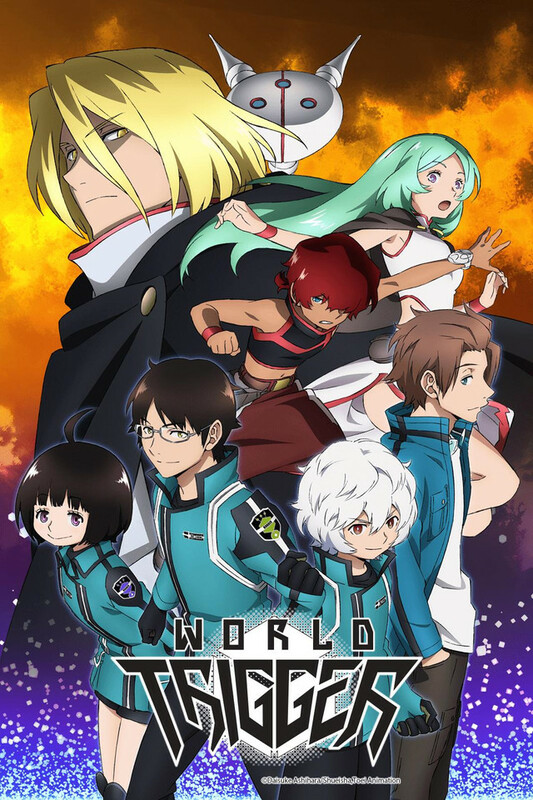 For fans of Attack on Titan, this anime is very similar in the initial plot and the way Border is divided, but at the same time, retains originality by diversity. This anime has many more pros than cons and definitely deserves to be watched. So far so good! 5/5 getting better every episode! Coming from someone who didn't read the manga, the anime is actually pretty good, the animation isn't top notch, but it's not bad either. Not all company's have the budget to provide Fate/Stay Night type animation. For what it's worth this anime is going to get better and better as the series goes on. Right now i think they're just trying to build momentum to a much bigger scene. We'll see the true color of the anime once all the characters have been explained and maybe then it'll get some popularity. This anime is super top-notch good! Way better than I expected it to be! Plot, characters, weapons, the whole nine yards. Going into it, I didn't really know what to expect. To be honest, I was just looking for something to watch to pass the time until a new episode of my main anime came on, but eventually this show became my main anime. I highly recommend watching it. This anime/manga series has wonderful potential to grow, it is designed to be a long standing series like One Piece, HxH, Naruto and Bleach. At this time there are already over 80 manga chapters and the story progressively gets better with each release. High hopes for this one folks! Interesting show, interesting plot, with interesting characters, with interesting development. Quite interesting, must watch to get interested. It revolves around the interesting main character and his interesting ability to put himself in situations he interestingly enough cannot handle. Yet before our interestingly weak hero gets interestingly pounded, an interesting mysterious fellow arrives to save him. The plot interestingly thickens, like interesting soup. I've been interested for so long, I give it five interesting stars. This show has a lot of potential, interestingly enough some may blow it off. Not so interesting, they are losers. Interestingly, I find myself compelled to write a not so interesting review about this interesting show, why? It deserves five interesting stars, definitely give it a shot. If you don't like it, interesting o3o. Osamu is interesting and supports this interesting review. I'm going to have to disagree with the opinion a lot of people seem to get from first impressions of this anime. I love it, especially the universe, plot, and characters. Worth giving a chance and continuing to watch. • This show has 50 episodes, the plot will not all be apparent in the first handful of episodes. Give it at least 15 or so episodes, AT LEAST. • Don't pre-judge the animation. Remember lots of other famous, good anime has unique styles of animation. (Fairy Tail, JoJo, Nanatsu no Taizai, Kingdom, Gash Bell etc) and all of those were worth getting over it. • The credits and OP/ED format is a little different, the recap at first seems annoying now but it will be convenient later on because it will have 50 episodes and it would be hard to find where you're leaving off without it. Just try to get used to the OP happening after the initial beginning part. Like most TV drama shows that start off in the plot. It's not that big of a deal and doesn't influence how much show you see. When I saw this show, it looked cool, but was skeptical because Toei was animating it. The intro to the first episode did little to improve my mood, with nothing but stills. However, that was last thing that upset me! I first was drawn in by the show's comedy, and stayed for it's plot. It starts off a little slow, but I appreciate it for that, as it gives itself a chance to fully flesh out it's characters. Also, the concept of Triggers are really interesting, and I can see many ways for this to go. After watching 12 episodes for twelve weeks, I've always wished the next one was already out! Love this show! Please keep it going! It just keeps getting better and better! It was so good that I had to read the manga just to satisfy my desire to find out what happens next! I usually don't write reviews, but I heard the contract for this anime is up to episode 80. So I wanna show support for it and hope that it continues! As someone who reads the manga and watches the anime I can honestly say this is one of my favorite series. It has an interesting pace that draws you in and makes you want to find answers. The development seems a little slow sometimes but almost all the questions get answered even if it takes a while. They do a good job of having such a large cast but making each one memorable.All in all it's a great show. At first it was really slow. But after after around episodes 10-14 the animation improves, the real fighting begins and it just becomes an all around better show. Its made by Toei Animation, who also has made notable series like One Piece, Dragon Ball (z)(kai)(super) and Toriko, to name a few. I'm marathoning it and I'm really enjoying it.